Leading Irish automotive component distribution company, CD Group has strengthened its fleet of commercial vehicles with the recent addition of five new Sprinter vans. 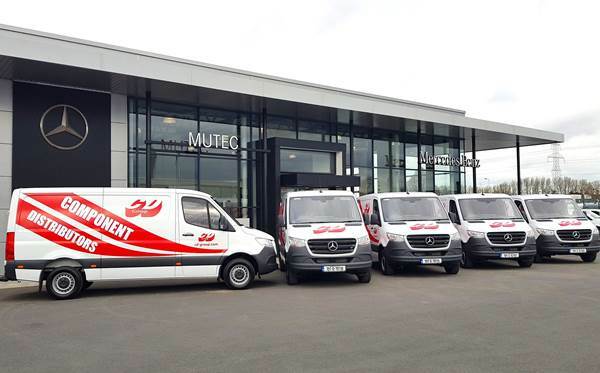 Supplied by Mercedes-Benz commercial vehicle dealer MUTEC, of which CD Group is a long-standing customer, the new units will soon be put through their paces delivering vehicle parts and components to motor factors throughout the country. Finished in the company’s distinctive white and red livery, each of the new Sprinter 314.36 low roof panel vans are fully ply lined and come with multifunction steering wheel, reverse camera and 7” MBUX multimedia system. Describing it as ‘an all-rounder for any business’ sector, Terry Knox, managing director of CD Group says: “When you couple the online connectivity system that gives operators comprehensive fleet control with the high-spec features and superior comfort in the new vehicle, it is easy to appreciate why the spaciously-large Sprinter was voted the 2019 Irish Van of the Year”. Established in 1963, CD Group specialises in the importation, sales and distribution of automotive aftermarket products to motor factors, body shops and fast fit centres throughout Ireland, North and South. With depots in Dublin, Cork and Mallusk, the Group now employs just under 200 people.